Soft Cover, 384 pages, 5x8. Pulitzer Prize finalist and former Wall Street Journal writer Ken Wells set out on America's mighty River of Beer (aka the Mississippi) in a quest for his own Oz: the mythical Perfect Beer Joint. Along the way he samples great beer with the Heartland's raconteurs, probes Elvis's beer-drinking habits, drops in on brewers and hopheads, tours the World's Largest Six-Pack and a bar once owned by Al Capone, and visits an Extreme Beer Maker whose dream is 50-proof brew. This is a vision of America that readers have never seen before- through the frosty prism of a beer glass. Travels with Barley is a lively, literate tour through the precincts of the beer makers, sellers, drinkers, and thinkers who collectively drive the mighty River of Beer onward. The heart of the book is a journey along the Mississippi River, from Minnesota to Louisiana, in a quixotic search for the Perfect Beer Joint -- a journey that turns out to be the perfect pretext for viewing America through the prism of a beer glass. Along the river, you'll visit the beer bar once owned by the brewer Al Capone, glide by The World's Largest Six Pack, and check into Elvis Presley's Heartbreak Hotel to plumb the surprisingly controversial question of whether Elvis actually drank beer. But the trip also includes numerous detours up quirky tributaries, among them: a visit to an Extreme Beer maker in Delaware with ambitions to make 50-proof brew, a look at the murky world of beer yeast rustlers in California, and a journey to the portals of ultimate beer power at the Anheuser-Busch plant in St. Louis, where making the grade as a Clydesdale draft horse is harder than you might imagine. 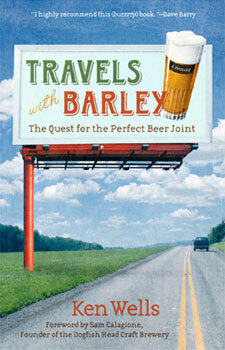 Entertaining, enlightening, and written with Wells's trademark verve, Travels with Barley is a perfect gift -- not just for America's 84 million beer enthusiasts, but for all discerning readers of flavorful nonfiction.